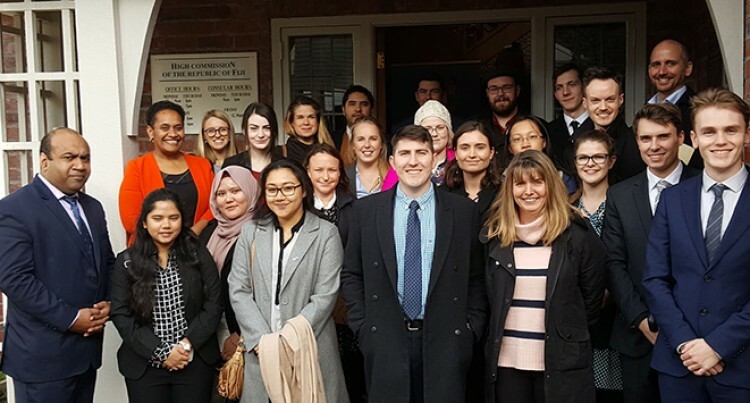 The Fiji High Commission in Wellington, this week, hosted 23 students from the University of Canterbury’s Masters in International Relations programme. At the High Commission, Second Secretary Josua Tuwere provided an overview of the mission’s work as the official representative of the Fijian Government in New Zealand. The presentation highlighted the mission’s role in New Zealand, its work with the Fijian diaspora and various stakeholders, Fiji’s foreign policy priorities, Fiji’s COP23 presidency and achievements of the UN Climate Summit in Bonn last year, development assistance from New Zealand and opportunities for developing the historical relationship between Fiji and New Zealand. The students, along with two lecturers, flew in from Christchurch. They are enrolled in the Department of Political Science, School of Language, Social and Political Sciences. Their visit was part of an educational tour of various institutions in Wellington. Group leader and senior lecturer Jeremy Moses thanked the Fiji High Commission for facilitating the visit. The visit has been an annual event for the past few years.